This is a Reunion Lunch for those in YG 1940-1958. A copy of the letter from Tony Watson who is organising it is below. 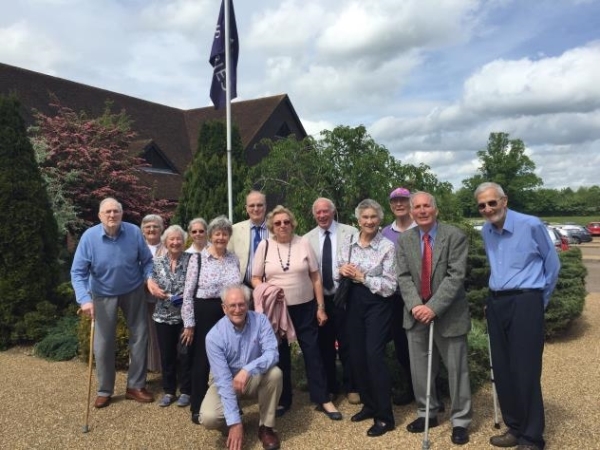 Following the closure and sale of the school there has not been a “Wrinkley lunch” since we met at “Denbies” in Dorking in 2017. Jane Gorman(Goodrich), who located the venue for us to try in 2017, has offered to arrange a lunch on the above date. The venue is Denbies Wine Estate, <?xml:namespace prefix="st1" />London Road, Dorking RH5 6AA. Those who were at the school in the 1940’s and up to 1958 year groups are invited to the ‘Wrinkley Lunch’ on the above date. Jane would like to have an initial idea of those members interested in attending this lunch. If there are sufficient members interested then further details with a request for acceptance will be sent in late March 2019. If you would like to attend the lunch please let me know by 3rd March 2019 that you are interested. Jane can be contacted on jaggorman@gmail.com or on 01737 241720) for information on Denbies but please contact me if you interested in attending. Full details of finding the Estate are on the web site, but it is on the West side of the A24 just North of Dorking. There is plenty of parking. For those near to Saffron Walden it may be possible to hire a Mini-bus. If you would like to consider sharing a mini-bus can you please contact me by email as soon as possible so we can investigate the availability and cost and agree timings. 12.00-12.30 Meet in the Entrance Hall Denbies Wine Estate for chat. 12.30 Lunch in the Conservatory Restaurant – self service. 1.30 Guided tours must be booked in advance, individually, direct with Denbies. If you don't want to do a guided tour we can stay at the tables chatting. If weather is suitable meet up outside for group photo before heading home.